Somehow I managed to trudge through the snow to the East Village today to meet a friend for brunch. I am not a fan of New York winters and I would much rather spend my day off looking at the snow through my bedroom window, bundled up in the warmth of my electric blanket. But food tends to have a draw on me. I pulled on some long underwear, slipped on a puffy jacket and topped off the whole Michelin Man inspired look with a knit beanie. I felt semi prepared but mostly hungry. I stepped outside and walked briskly to the subway, all the while imagining Eggs Benedict, bacon and coffee as my much deserved rewards for braving the elements. 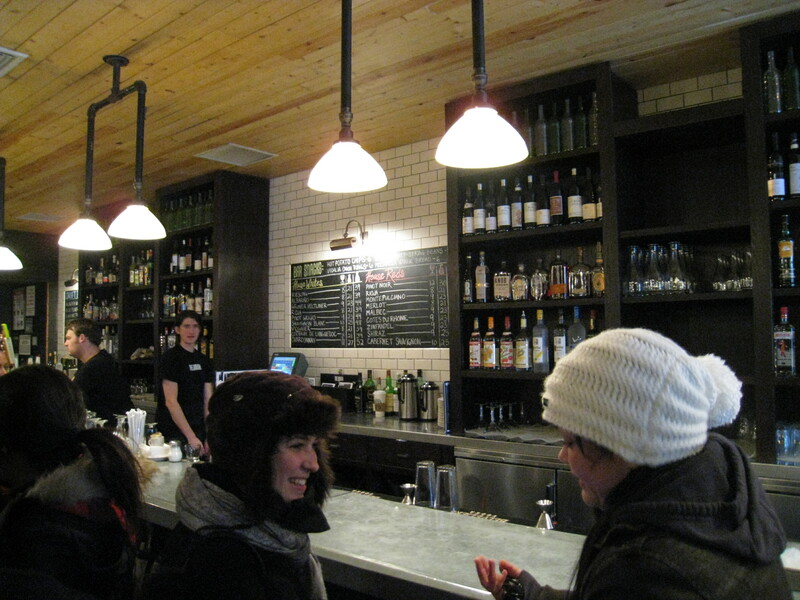 The Smith is a very hip breakfast, brunch, lunch, dinner spot that is always packed. In the summer, the glass doors open out onto the streets letting passerby’s catch a whiff of not only the food, but of the cool melodies that give this restaurant its trendy, hipster approved vibe. In the winter, it rewards with cozy warmth. After having peeled off my many layers and settled into the banquet, my eyes scrolled over the menu and landed on the Ranchero Scramble. Last week at home, my mom took me and the sibs out for breakfast. I ended up ordering the huevos ranchero (with poached eggs) and received a lovely plate of re-fried black beans, chunky pico de gallo, salsa verde, cilantro and a couple of corn tortillas. It was almost soupy with the amount of salsa ladled onto the perfectly cooked, runny eggs…and I loved it. There was so much flavor and freshness packed into the dish. I was still living on the dream of this last breakfast and made the mistake of switching my original idea of Benedict for Ranchero. It’s like when you used to take SAT’s in school and you would switch back and forth, back and forth betweeen bubble A and bubble C. You would later find out that your first bubble marked was the correct one. “Always go with your intuition” or your ‘gut’ feeling I guess. I chose bubble C and ended up receiving two dried tortillas on a small splotch of pureed black beans. The scramble was a bit overcooked (though admittedly I do like my scrambleds on the very soft spectrum of doneness) and the avocado looked as if it had been left to sadly sit without its pit partner for quite some time. 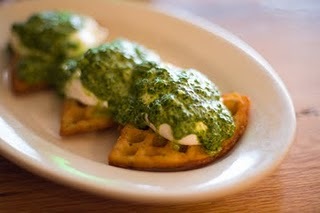 Kyle, always knowing what to order, picked a version of benedict I’ve never heard of: Potato Waffle Benedict. In my head, screeching wheel sounds due to abrupt stops were echoing in my head. Whaaaat??? Potato waffles? I’ve had potato ladkas, thin dosa “crepes” filled with potatoes, potato blintzes, potato tortillas…but waffles were a whole new breakfast item unfamiliar to me. I’m also very familiar with Benedicts in general; I would even venture to call my self a connoisseur: California Benedicts, Smoked Salmon Benedicts, Eggs Florentine..I’ve eaten many a variation too. But this take on the oh-so-often ordered breakfast item was now throwing me for a loop. I had a hard time imagining that I could like this version of poached eggs on carbohydrate more than the traditional english muffin and Canadian bacon version. But it stood up to the challenge like a real spud. 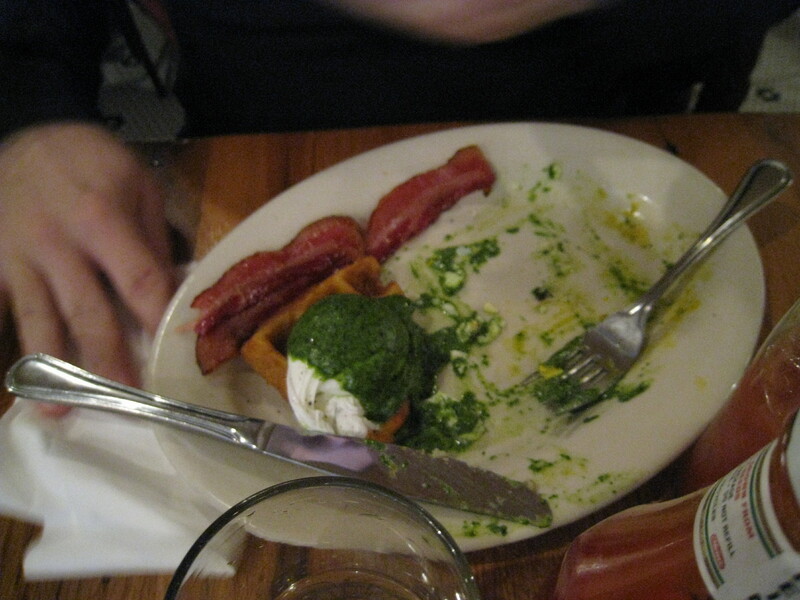 The waffles were fluffy and savory, big on potato flavor, and were perfect sponges for the parsley sauce and yokes begging not to be left behind. Not one drip. The Bloody Marys were good (whoa on the horseradish) but the side of potatoes were limp. However, fizzy water is complimentary. I’ve never eaten at a restaurant with free fizzy water, and that made me love The Smith a bit more. On average, the brunch seemed average. In a good, standard, go-to kinda way. Brunch is really about the gathering of friends after a big night out though, isn’t it? So I’ll say that The Smith played its role well. I had good conversation, eggs, Bloody Marys and the occasional stolen bit of waffle, all while enjoying the music and the eye candy this restaurant provides. The Smith. Not only a name for an awesome English band, but now a restaurant recognized for a good brunch and some killer waffles in the East Village. Rock on. I can taste the words. Finally. Why do you always make me wait? I’m happy it’s here. May I have another? Please.